Monterey Jack earns the rightful position as a true “American” cheese since it originated in the Mexican Franciscan friars of Monterey, California. Around the 1700s, these monasteries around the Monterey region were making a semi-firm, creamy, mild flavoured cheese from cow’s milk which they aged for a little period. An American entrepreneur named David Jack realized its commercial value and started selling it all over California. The cheese came to be known as “Monterey Jack's” or “Jack's Monterey,” eventually acquiring the name Monterey Jack. The cheese is commonly used in Mexican and Spanish cuisine as its mild in flavour and melts really well. It's akin in taste and texture to Colby and Cheddar. 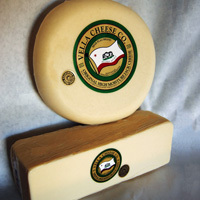 Variants of Monterey Jack known as Dry Jack (aged version) and Pepper Jack (pepper spiced) are also quite popular. Monterey Jack is available across all grocery stores and supermarkets in the United States. Consider Pinot Noir and Riesling with Jack cheese.